(2 x HDMI, 2 x Component, 2 x S-Video and Composite video) and also Background Color for special efficiency. The output supports 1 x HDMI, 2 x Component, 2 x S-Video and Composite video with position adjustment and recording. The output supports HD/SD resolutions such as NTSC, NTSC-4.43, PAL, PAL-M, PAN-N, SECAM, 480p, 576p, 720p 50/60, 1080i 50/60. Selective size and position for digital effects area and PIP windows. Digital effects- Still, Mosaic, Paint, Negative. Chroma key & Luminance key. Joystick control for digital effect position. Fade control for Video and Audio. Automatic fade and wipe with speed preset control. Extra Microphone input and Headphone output. Picture in Picture control (3 window sizes). Each A/B BUS can adjust the Contrast / Brightness / Color / HUE / Detail & Aspect Ration. Supports Lip-Sync delay up to 170ms. Composite supports 3D comb filter and YC separation. Motion and Edge Adaptive De-interlacing. Note: When receiving content that has HDCP encryption there will be no video output except for HDMI output port. 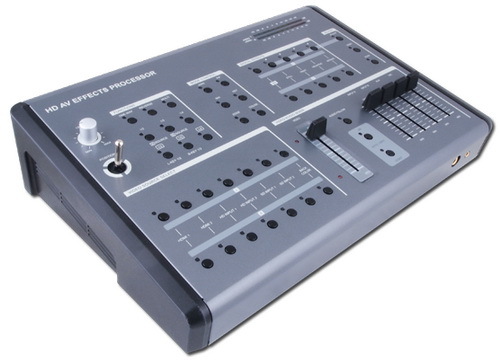 Digital Video Mixer Operation Manual (PDF 3,5MB).